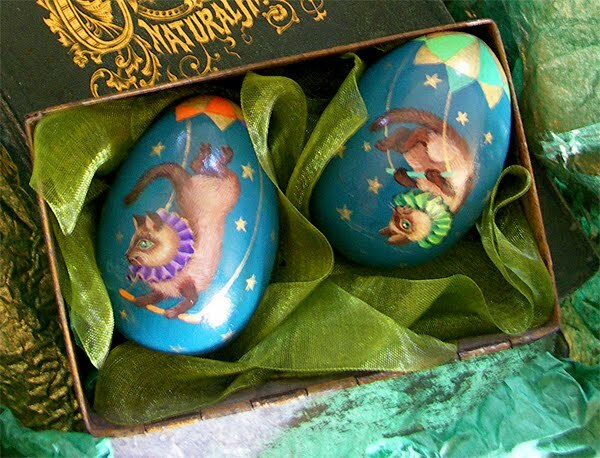 Every Easter since my twin sons were one, I've painted each of them a wooden egg to commemorate a special interest or event in their lives that year. I painted these the year they first went to the circus. They were fascinated by the trapeze artists. They were also obsessed with Siamese cats at the time, hence the acrocats. What a lovely idea! Beautiful. Wow, these are incredible! Beautiful work, and a very fascinating story. How wonderful for your sons to have such a creative mother making them such special gifts! These beautiful keepsakes, painted with love, will evoke memories for your sons to share with further generations. What a lovely timeless gift. These are wonderful as is the meaning and reason behind them. These are incredible. I'd love to see a picture of all your eggs. That will be some collection when they are older. what a wonderful gift for your children! really nice! What a wonderful idea. Your sons are so lucky! I am not sure it would work out financially for you. . .but man you could definitely sell these kind of things if you wanted. They are gorgeous!